For Christmas, I made this kimono dress for my niece using Heather Ross' Weekend Sewing. It's a great book with over 40 projects. 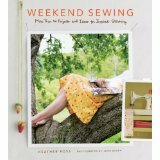 The best piece of advice I gleaned from the book was that even a skilled seamstress such as Heather Ross gets her hand made dresses and skirts professionally hemmed. She explained that it's worth the $5 or $10 to make a project look professional. I tried my best to hem properly and follow the directions, however, the dress came out WAY to big. It was meant to be a small and it ended up something like a size 10. I'm not sure how this happened. Perhaps I was a little lose with my scissors. So, I'm hoping for a growth spurt from my niece.